A freshly prepared continental style breakfast and Wi-Fi access are included during your stay. For more details about making a reservation or to check availability, please visit our Reservations page. 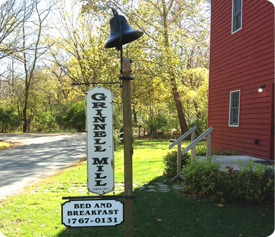 Grinnell Mill is filled with antiques from the original operations as well as exquisite woodwork and comfortable period furniture. In addition to the restored mill wheel, the back deck has two tables and a grill for dining in a delightful outdoor setting. 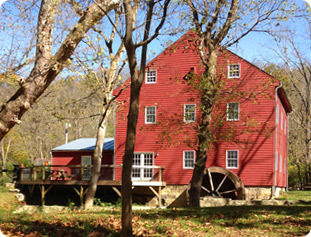 The Mill is also available to rent for private events such as retreats, meetings, conferences, parties, etc. – please get in touch for more details. Please review our Rules and Policies. 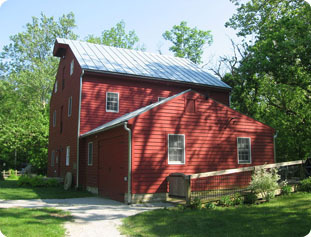 View a map and get directions to the Mill. We want to hear from you! Please send us any questions or comments below. Fill out the form below and click Submit. Required fields are marked by an asterisk (*). Copyright 2019 Grinnell Mill Bed and Breakfast. All rights reserved. Designed & Hosted by Servlet.